Forklift Training Classes Calgary - Forklift are heavy pieces of industrial equipments which are used in the handling and transporting of materials and merchandise. They are usually known as Lift trucks and are found in all sorts of industries. Personnel working with and around forklifts must be trained to recognize hazards connected with the use of forklifts. 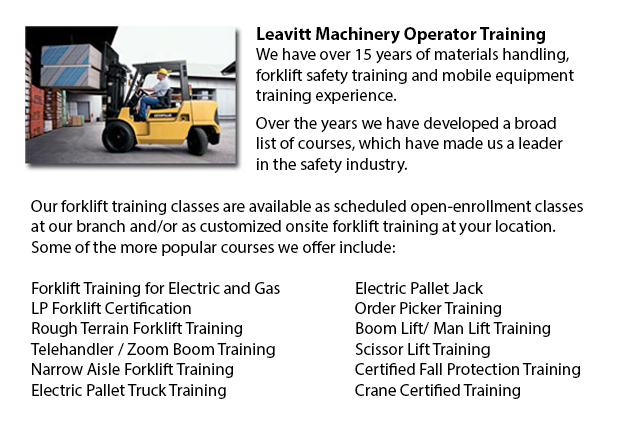 We offer training classes called Safe Operation of a Forklift. The classes provide instruction in the theory part of becoming a lift truck operator. People training will learn their legal tasks as forklift operators. Upon completion of the classes, a printed certificate will be given. The certificate must be signed by an individual authorized to verify that a hands-on evaluation has been finished within the trainee's workplace. Forklift trucks are important in industrial workplaces for their ability to transport and lift heavy loads. Forklifts are indispensable to various industrial worksites, but forklifts can be dangerous without correctly training personnel. Lift truck injuries, when they occur, tend to be serious due to the power of these heavy machines. Employees who work often around forklifts can become complacent and forget the dangers. Vital maintenance and operating procedures could be neglected. Forklift training is required not only for new staff. Periodic re-training is vital for all operators. First aid training is also vital. Daily inspection procedures are of critical importance. Forklifts can become damaged if they are not checked frequently. Before being used, lift trucks must be visually inspected as to their general condition. An operational check should be carried out in order to determine the machine is working correctly. The supervisor needs to be informed if anything is noted that can affect the safe operation of the lift truck. A check determines if the area is clear of things which can pose a hazard. Whatever overhead obstructions must be noted. Check that a working fire extinguisher is accessible. Different levels should be inspected, like engine oil, fuel, radiator water, and electrolyte levels in cells. Battery, cables and plug must be inspected. Clean out vent caps and ensure that bolts, nuts, chains, guards, and hydraulic hose reels are not loose, damaged or missing. A tire inspection would make certain that wheels are not damaged or worn. Pneumatic tires would need a pressure check.